Do you wish to bring back the good look of your windows quickly and with ease?Are you searching for techniques of efficient window cleaning? If so, you have come to the right spot! 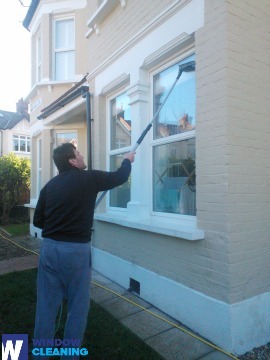 With the specialists of window cleaning in Leyton Marshes, you will certainly bring back the daylight into your home. You will enjoy spotless windows as well as completely clean frames and sills. You will be able to use your freshly-acquired spare time as you want to while we polish the windows of your home. You will not only stay away from this tedious and burdensome work – our services will in addition to that bring you some alluring advantages. We also provide our professional services in nearby areas: Lea Bridge, Leyton, Upper Clapton, Snaresbrook, Cann Hall. We provide private and business window cleaning by using sophisticated techniques. You can rely on our expertise for all types of glass surfaces, skylights and greenhouses. For windows placed as high as the fourth floor, we use water-fed extension poles. This procedure is comfortable and allows risk-free cleaning systems – the poles are connected to the water reservoir in the vehicle. For higher window surfaces, our rope access team will grant you fast and efficient end results. You can gain a lot from these methods right now – just dial 020 3746 3113 and place an order! With our professionalism and technical excellence, you can rely on us for domestic and business window cleaning. Your home will look pristine after the services, regardless what type of windows you have. We polish and wipe single, French doors, sash or double windows, bay windows and patio doors. In addition, we clean garden windows, skylights and greenhouses. In other words, you can count on us for flawless cleaning of your windows, including frames and sills. Improve the look of your building – the experts of commercial window cleaning will deal with that. As part of our specific technique, we use water-fed extension poles. With this method, we can clean completely the windows of your business premise, as high as the fourth floor. In order to reach higher windows we use rope access. We make sure your windows will look great, no matter how high is the building. With the help of the team of specialists London's skyline shall never be dusty. Profit from our residential window cleaning in Leyton Marshes – we provide great services for your home on attractive prices. We use purified water to clean the windows thoroughly. We stay safely on the ground and clean with water-fed pole system. Find us now - call 020 3746 3113 or just fill in our booking form. Our staff will help you book and answer all of your questions. You will love the results of our domestic services, we guarantee that! The nearest tube station serving E10 Leyton Marshes is Leyton.